The VOLCANO ERUPTED and spewed a river of lava that hit the village of El Rodeo, destroying houses & BURNING people inside. Twenty-five people have been killed and hundreds injured after Guatemala’s Fuego volcano erupted. Rescue operations are under way as state and local agencies battle through ash cloud and high temperatures to search for stranded survivors. Reports from the ground describe the scene as something like from a Hollywood set, chaos and carnage, hot ash in the air and a thick smoke causing havoc throughout the area. The volcano has been spewing rocks, black smoke and ash into the sky. The volcanic eruption spewed a river of red, hot lava and belched thick clouds of smoke nearly six miles into the air, according to the government’s national coordinator for disaster reduction. The National Disaster agency CONRED has ordered evacuations and has urged residents living near the volcano to evacuate immediately and warned nearby residents of the towns of Chimaltenango, Sacatepequez and Escuintla to watch out for volcanic rocks and ash. Accoriding to reports from the ground and CONRED, The volcano explosion stands to affect a staggering 1.7 million people. Several children are among those confirmed dead. President Jimmy Morales said a national emergency response had been launched. This eruption is the biggest since 1974, according to local experts. Sergio Cabañas, The head of CONRED, told a local radio station that a lava stream had changed course towards El Rodeo. “It’s a river of lava that overflowed its banks and affected the El Rodeo village. There are injured, burned and dead people. 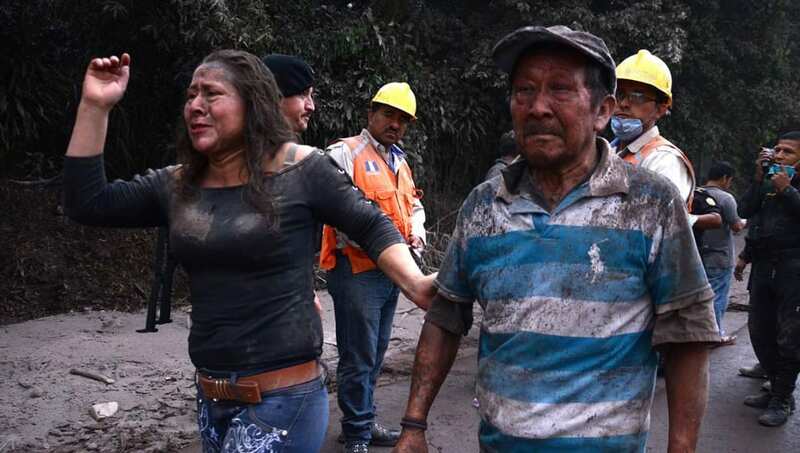 This is still a very fluid situation as explosions are still coming from the volcano, said Eddy Sánchez, director of the National Institute for Seismology, Vulcanology, Meteorology and Hydrology of Guatemala known as INSIVUMEH. He also warned of further carnage as mudslides and rainfall continues, and urged people to stay off roads close to the volcano. The Guatemalan military said it was providing assistance from rescue operations to setting up temporary shelters and clearing volcanic ash from La Aurora airport’s runway.